Our aim of the business is to offer a service from project conception through to building completion and hand over. Although design expertise is not carried out within the company, access to design and architect facilities can be provided. We will manage the whole project from plans, planning permission, building regulations to completion. Extension – Large conservatory/extension, retaining walls, large patio area, curved garden steps. Side Elevation Extension – Side elevation of large conservatory/extension. Flower Bed – Double brick curved retaining wall flower bed complete with coping stones. 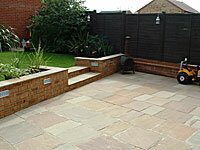 Patio and Steps – Large patio area made with Fairford Riven Random Sized slabs. Large Patio and Wall – Retaining wall and steps with large patio area constructed in natural sandstone bricks and paving stones complete with designer low voltage mood lighting. Landscape and Built-up Decking Area – Railway sleeper retaining wall & steps, black metal balustrades, 2 large timber deck areas, turf laid to area, close boarded panels, concrete posts and gravel boards. 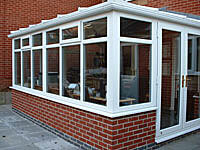 Conservatory – Matching bricked dwarf wall complete with white UPVC double glazed conservatory with side opening doors. Garage Conversion – Integral garage conversion completed under Building Regulations. Garage conversions can give you that extra room you need. Fire Retardant Boarding at School. complete with new UPVC door access and finished in a fire retarded paint.